Celie is the youngest daughter of King Glower the 79th, and the member of the family who feels most comfortable in Castle Glower, the family's home. The castle is confusing, to be sure, considering it can add new rooms and take them away at will (something that frequently happens on Tuesdays), but Celie, who feels that the castle is very much a living being, has an uncanny way of navigating the ever-changing hallways. This ability becomes a matter of survival when, suddenly, the king and queen and their oldest son, Bran, are presumed dead after a robbery on the road to the castle, and Celie's fourteen-year-old brother Rolf is named King. Because Rolf is so young, several parties become interested in overthrowing him and stealing Castle Glower away from its rightful owners. In the meantime, there are several signs to indicate that the King and Queen and Bran have not perished after all, but only Celie, Rolf, and their sister, Lilah, seem interested in pursuing the truth. I really enjoyed this fast-paced story, where the setting is as much a character as any of the humans. A blurb on the back of the book mentions both Howl's Moving Castle and Hogwarts as a means of describing the Glowers' castle, and these are apt comparisons, but Castle Glower is also very much an entity unto itself, with its own quirks and mysteries that I imagine will only become clearer in the sequels. The plot of political intrigue is easy to follow, even for kids who have no knowledge of monarchies, and readers will be fascinated by the idea of a child their own age being crowned king, and by the notion that kids their age could potentially save their home and family members without adult intervention. This is probably the most appealing aspect of the book: that kids, using their own wits, and the occasional immature prank, are able to overcome truly formidable and dangerous opponents. 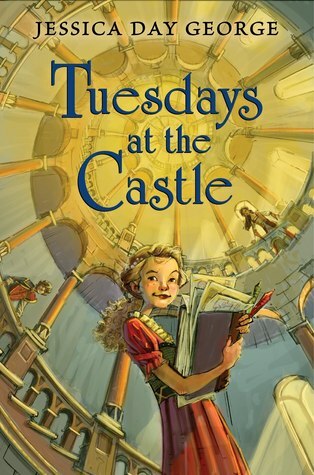 If all fantasy novels were as quick and fun to read as Tuesdays at the Castle, I'd probably read a lot more of them. Happily, there are three sequels to this book: Wednesdays in the Tower, Thursdays with the Crown, and Fridays with the Wizards, with another, Saturdays at Sea, due out in 2017. I will be eagerly snapping them up sooner rather than later! I thought this was a cute book too, and I enjoyed the changing nature of the castle. I've read Wednesdays and Thursdays is on the shelf- I didn't know about Saturdays so that's good to know!